Open your child’s eyes to the wonderful world of dance! Prerequisites: No previous dance training required. Dancers aged 3+ will develop their sense of musicality while engaging in imaginative play. This class will encourage students to explore aspects of movement including space, size and shape. Explore the beauty and harmony that dance has to offer! Prerequisites: No previous dance training required. Ability will be assessed by A. Bayne. 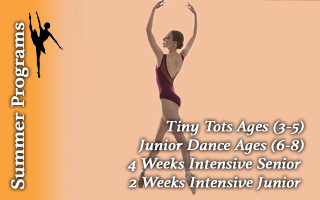 Dancers aged 4+ will learn the basics of ballet technique, music and movement. This is a suggested pre-requisite to Primary Ballet 2. Enjoy the first ballet steps! Prerequisites: One year of dance experience. Ability will be assessed by A. Bayne. 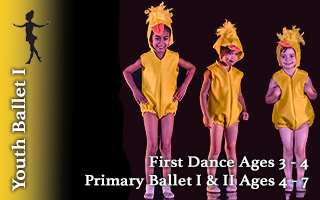 This class is for dancers aged 5+ that have already completed a minimum of one year in Primary Ballet. 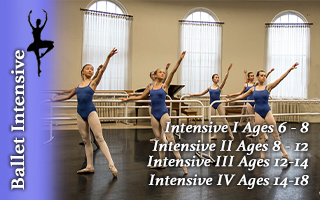 Students will further their studies on the basics of ballet technique, music and movement.